I had never heard of Dr. Thorndyke and R. Austin Freeman, and now I’m happy I know both. Being familiar with Sherlock Holmes, I found out that the two detectives resemble each other in some ways. The sidekick in the form of Jervis, the quickness of solving cases, and the deduction were some of the more obvious points. The biggest difference was the niceness of Dr. Thorndyke. He seemed more of a likeable person, complementing people and showing more concern. The stories were all highly enjoyable. Some of them gave a point of view from the murder and murderer, giving you the knowledge Dr. Thorndyke doesn’t have (the case of Oscar Brodski). 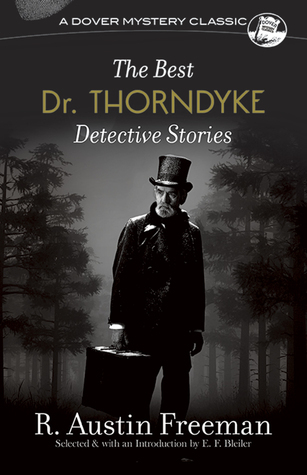 The way Thorndyke deducts and gets to conclusions and solvings of the cases is remarkable. I didn’t predict the way Thordyke thought and couldn’t find the clues in any way. Such clever twists were done marvelous by R. Austin Freeman, giving me the feeling of surprise. Some of the stories were a little dreading in the beginning, starting with the story explained in the beginning, which was a long story (the mandarin’s pearl). The switch to case solving went really fast on the other side, giving a stream of answers at once, which made the stories complete and fun in the end. I thought it was amazing that R. Austin Freeman managed to create such an amount of short stories about detective cases, feeling myself that a detective story needs a lot of explaining and plot to give a good complete case. Freeman actually managed to do that in short stories, and a lot of different ones. I felt like the story was complete at the end, having solved the case and touching all the important points of the case. Overall I thought this was a great collection of short stories, for example especially if you want to finish a story before bedtime.